Clove oil (Syzygium aromaticum) - information on the origin, source, extraction method, chemical composition, therapeutic properties and uses. Clove essential oil is extracted from Eugenia caryophyllata (also known as Syzygium aromaticum, Eugenia aromatica, E. carophyllus) of the Myrtaceae family. Although clove oil is a very potent oil that should be used with great care in aromatherapy, it does have wonderful properties - from stimulating the mind and lifting depression, to aiding digestion, relieving pain in arthritis and rheumatism, easing respiratory problems and assisting leg ulcers. 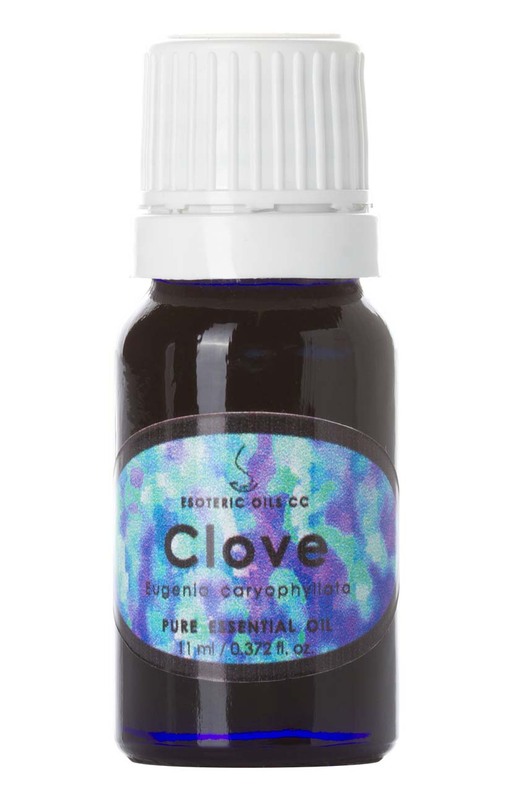 Clove oil has a warm, strong, spicy smell and the oil is colorless to pale yellow with a medium to watery viscosity. A native of Indonesia and the Malacca Islands, it is an evergreen tree that grows to about 10 meters (30 feet) tall and has bright green leaves and nail-shaped rose-peach flower buds which turn, upon drying, a deep red brown. These are beaten from the tree and dried. The Latin word 'Clavus' means nail shaped, referring to the bud. It was often used by the Greeks, Roman and the Chinese, to ease toothache and as a breath sweetener, especially when talking to the Emperor. It has antiseptic properties and was used in the prevention of contagious diseases, such as the Plaque. It was an important commodity in the spice trade and is still used in perfumes, mulled wines and liqueurs, love potions, dental products and, stuck in an orange as pomade, an insect repellant. Clove oil can be extracted from the leaves, stem and buds. We sell clove leaf oil, which is extracted by water distillation, containing the desired lower percentage of eugenol. Clove oil is a very potent oil and should be used with care. If it is used in a oil, lotion or cream applied to the skin, the concentration should be well below 1%. It may cause irritation to the skin of some individuals and can easily irritate the mucus membranes. It should be avoided during pregnancy. The therapeutic properties of clove oil are analgesic, antiseptic, antispasmodic, anti-neuralgic, carminative, anti-infectious, disinfectant, insecticide, stimulant, stomachic, uterine and tonic. Clove oil can be used for acne, bruises, burns and cuts, keeping infection at bay and as a pain reliever. It helps with toothache, mouth sores, rheumatism and arthritis. It is beneficial to the digestive system, effective against vomiting, diarrhea, flatulence, spasms and parasites, as well as bad breath. Clove oil is valuable for relieving respiratory problems, like bronchitis, asthma and tuberculosis. The disinfecting property is useful in cases of infectious diseases. Placing a few drops of clove oil on a cotton ball and then placing the cotton ball in a linen cupboard will not only fragrance the cupboard, but will help to keep fish moths at bay. Clove oil is useful for its disinfecting properties, relieving of pain, especially toothache, arthritis and rheumatism. It is effective when used for complaints of the digestion system. It is also of use for skin problems - especially for skin sores and leg ulcers and as an insect repellent. Clove oil can be used in a blended massage oil to assist with diarrhea, bronchitis, chills, colds, muscular numbness, spasms, rheumatism and arthritis. For toothache the outer jaw can be massaged with this oil. Use a low dilution of less than 1%. When used in a cream or lotion, the positive effects of clove oil are the same as those of a massage oil and can furthermore help to sort out leg ulcers and skin sores. Use in low dilution of less than 1%. Clove oil can be included at a low rate as part of a mouthwash for toothache. It blends well with basil, benzoin, cinnamon, lavender, ginger, sandalwood and clary sage.